The 1,800-ton displacement, 74.8m, twin-screw vessel will feature a Rolls-Royce scope of supply that includes a pair of Promas controllable pitch propellers and rudders, SC722 FCP steering gear, a TT1300 bow thruster, a TT100 stern thruster, fin stabilizers, and a touchscreen remote control system that incorporates the novel CanMan Touch Joystick for all units. Rolls-Royce will also integrate the various operation modes of the hybrid diesel-electric-propulsion modes via a power take-in (PTI) for lower patrolling speeds of up to 12kts. This will ensure lower through-life operating costs. A key advantage to operations will be the portable Rolls-Royce CanMan Touch Joystick, which navigating officers can use to maneuver the ship remotely from the bridge wings in addition to conventional/independent propulsion controls. It is suitable for a wide range of vessels to control and monitor engines, fixed-pitch and controllable-pitch propellers and systems with multiple bow and stern tunnel thrusters. When delivered in 2020, P71 (Hull No. 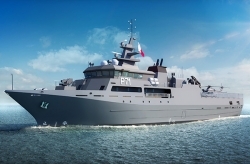 C.0890) will be the largest patrol vessel to emerge from the Vittoria shipyard and the flagship of the AFM, complementing the OPV P61 Saettia-Class patrol vessel and fulfilling AFM’s requirement for a vessel with greater endurance, sea-keeping and maneuvering capabilities and improved lifecycle costs, including fuel consumption and maintenance. Lars Johansson, Rolls-Royce area sales manager, Kamewa naval propellers, said, “This is a significant order from a long-standing customer of Rolls-Royce. Having supplied Cantiere Navale Vittoria with equipment for many of its smaller 40m patrol and coastguard vessels, we are delighted to now assist the shipbuilder in meeting market demand for larger vessels. Vittoria intends to be a significant player in this market. “We are also delighted to further strengthen our cooperation with the Armed Forces of Malta, having assisted them over the years to maintain Kamewa water jets forming part of the propulsion system of two search-and-rescue launches.